Even as the U.S. Air Force is working to get its F-35s back in the air by year’s end, service leaders are starting to think about their next strike aircraft. It is “absolutely essential that we look forward into the next generation of penetrating capability,” Chief of Staff Gen. David Goldfein told reporters who asked about the prospects for a new fighter to deploy along the F-35. Echoing the service’s Air Superiority 2030 Flight Plan, released in May, Goldfein called for a new “penetrating counter-air” capability that would “push as far forward” as technologically feasible. He didn’t say whether that capability would take the form of a network of weapons and other technologies or a sixth-generation fighter jet. But speaking Tuesday at the Air Force Association’s Air Space & Cyber conference just outside Washington, D.C., the chief of staff noted that the new capability would have to compete for resources with the Air Force’s other priorities. Meanwhile, the service is also piecing together funding to rebuild the force’s manpower and modernize its nuclear arsenal. More immediately, the Air Force’s advanced air capabilities will depend on the scramble to bring the grounded F-35s back to operational capacity. After the service discovered that 57 jets—15 in operation use, 42 in production — were compromised by sub-standard tubing whose insulation crumbled into fuel tanks, it spent the next week and a half looking for a fix with the fighter jet’s manufacturer, Lockheed Martin. 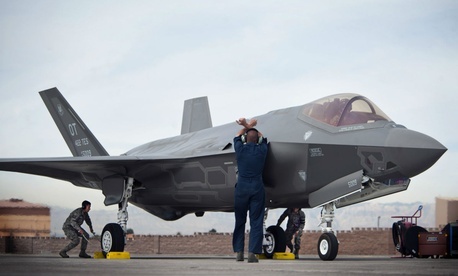 The current solution — to be validated early next week on a Lockheed ground test airplane — is to cut holes in the F-35’s wings and go in through access panels to remove the faulty insulation, said Lt. Gen. Christopher Bogdan, the aircraft’s program executive officer. As straightforward as Bogdan’s description may sound, don’t expect it to be completed immediately. Both Bogdan and Carlisle said the problem is confined to these 57 aircraft, which were equipped with a faulty batch of installation supplied by a sub-contractor. There are no similar problems with other A-, B- or C-models, they said.